In two earlier posts, I discussed the literary structure of Matthew chapters 8 & 9 as well as one of its two distinctive narrative interludes (Matt. 8:18-22). Those posts can be found here and here. In this post, I plan on discussing the second narrative interlude (Matt. 9:9-17). As noted before, each of those brief narratives describe two types of disciples, and there are no miracles or dramatically divine manifestations which accompany them. Jesus doesn't rebuke the stormy waves of an ocean or resuscitate anyone from death. There is just a very basic message of discipleship with two types of disciples on display in each of them. But who (or what) are the two types of disciples on display? Study Matthew 9:9-17 below and decide for yourself. If there are two types of disciples to be found in this narrative, who or what are they? As Jesus passed on from there, he saw a man called Matthew sitting at the tax booth, and he said to him, "Follow me." And he rose and followed him. And as he reclined at table in the house, behold, many tax collectors and sinners came and were reclining with Jesus and his disciples. And when the Pharisees saw this, they said to his disciples, "Why does your teacher eat with tax collectors and sinners?" But when he heard it, he said, "Those who are well have no need of a physician, but those who are sick. Go and learn what this means, 'I desire mercy, and not sacrifice.' For I came not to call the righteous, but sinners. Then the disciples of John came to him, saying, "Why do we and the Pharisees fast, but your disciples do not fast?" And Jesus said to them, "Can the wedding guests mourn as long as the groom is with them? The days will come when the groom is taken away from them, and then they will fast. No one puts a piece of unshrunk cloth on an old garment, for the patch tears away from the garment, and a worse tear is made. Neither is new wine put into old wineskins. If it is, the skins burst and the wine is spilled and the skins are destroyed. But new wine is put into fresh wineskins, and so both are preserved." Even though I think there may be a parallel theme between the rejection of a "scribe" in the first narrative and "the Pharisees" in the second narrative, I'm not quite convinced that there is much more of a parallel between the two types of disciples. After all, Jesus clearly rejects the disciples of John too, whereas the unnamed "disciple" of the first narrative interlude very likely followed Jesus (at least on to the boat, as shown in an earlier post). This leads me to suspect that the two types of disciples in this narrative are different, and perhaps much more obvious than what first meets the eye. And behold (! ), upon a second look at the text above, there actually are two types of disciples other than the Pharisees and John: one type is "reclining at table" with Jesus and his disciples; the other type is not, because they are fasting. If we simply follow the way in which this narrative interlude begins, and keep that as the background of the entire discussion, these two types of disciples will become apparent very quickly. Notice first that Jesus calls Matthew by saying "Follow me!" Only a few moments later, we find Matthew hosting a feast with Jesus and his disciples as honored guests. (Luke's gospel is even more explicit about this "great feast" in Matthew's house; 5:29.) Previous to this story, the only other times that Jesus said "follow me" to a disciple, were directed at Peter and Andrew together (Matt. 4:18) and to the unnamed disciple who got on the boat with Jesus (8:22). Immediately Matthew is placed alongside those who follow Jesus and feast with his disciples, and all those who "recline at table" with Jesus become associated with Jesus and those disciples who wish to follow him. This idea is made even more explicit when we read that Matthew leaves his day job of tax collecting -- his "tax booth" -- to follow Jesus, which is immediately followed by a feast in Matthew's house along with Jesus and fellow "tax collectors." Notice the sense of alarm which Matthew applies to these potential disciples: "Behold! Many tax collectors and sinners came and were reclining with Jesus and his disciples." This then sets the stage for distinguishing the two types of disciples portrayed within this narrative interlude. There are clearly those who feast with Jesus and his disciples, and there are those who don't. There are those who wish to follow Jesus, while others maintain no such desire. In fact, when these two types of disciples are compared side-by-side, Matthew makes it seem as though the ones who don't wish to eat with Jesus are the ones who we are supposed to be the most concerned about. Although Matthew doesn't come out and say this, it's as though the text is shouting out at us, saying, "Behold! The disciples of the Pharisees and John are not feasting with Jesus! 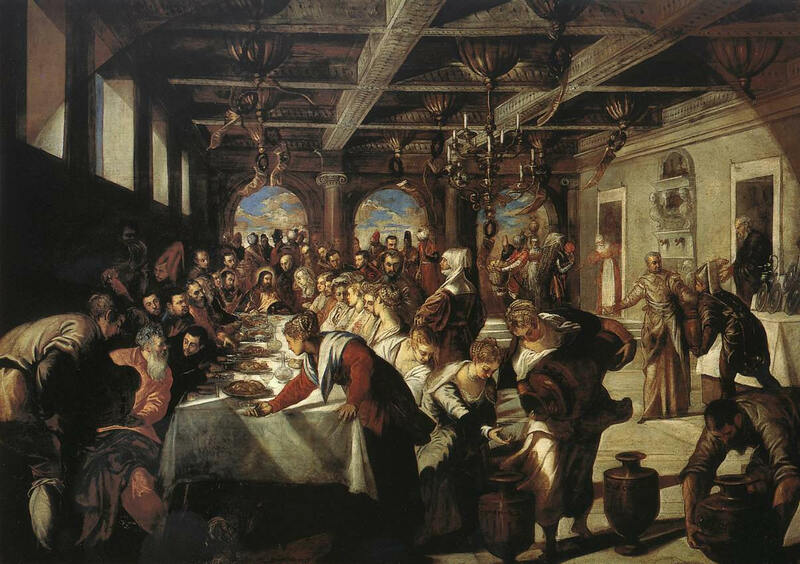 The disciples of the Pharisees1 and John refuse to break their fast!" In fact, not only do they refuse to break their own fast, they each challenge the validity of table fellowship within Matthew's house. Consider the following facts as background information: The Pharisees greatly despised the profession of "tax collectors," but they saved a special disdain for Jews who chose that profession. The Pharisees viewed such Jews as "unclean," alongside other "sinners. "2 And even the term "sinners" did not mean what twenty-first century western Christians generally think it means, namely that those people were generally recognized as sinful. Instead, the term "sinners" was used in a specifically snobbish way among Pharisees in the first century, and therefore would have been very familiar to Matthew's Jewish audience.3 Pharisees described "sinners" as people below them, people who were considered uneducated in the Torah because they did not adhere "properly" to the Pharisaical food, tithing, and purity laws.4 Not much has changed since the first century. Even in the twenty-first century we find modern pharisees with this same snobbish mentality that opposes "sinners" who smoke, drink, chew, and go with the girls who do too. Whenever this religiously snobbish mentality pervades a culture, it's hard to avoid it or to not notice it at all. And as Craig Keener points out, this particularly snobbish label was so pervasive in the first century that even rabbis who tolerated "sinners" were considered "sinners" in the eyes of the Pharisees.5 In the eyes of Matthew's Jewish audience, it was understood that these "sinners" communicated uncleanness just as much as "tax collectors" did. Matthew's Jewish audience would have been able to read between the lines of his story, so to speak, and clearly distinguish between those who were promoting table fellowship with Jesus and those who were attempting to disrupt table fellowship. Also, notice carefully that there are two confrontations during this time of table fellowship. The first confrontation is with Jesus' disciples, not Jesus directly, and yet it concerns table fellowship with Jesus. In a similar manner, the second confrontation is with Jesus directly, but their concern is about table fellowship with Jesus' disciples, not Jesus per se. And so, collectively, Matthew paints a picture of the Pharisees disrupting fellowship on one end of the table, and the disciples of John disrupting table fellowship on the other end. While disciples of Christ are feasting, the disciples of antichrist are fasting. These two types of disciples set the tone for understanding this narrative interlude. From beginning to end, those who are fasting each have their own axe to grind, whereas Jesus remains confident that they're not the sharpest tools in the shed. Those who refuse to break their own traditions of fasting may look down upon others as "sinners," but they're the ones who are missing out because the Messiah has come to save sinners (Matt. 9:13). Those who are "well" may simply want to avoid feasting with the unclean in order to prevent further ceremonial defilement; but the Messiah isn't afraid of ceremonial defilement. The Messiah has come to feast with the unclean because it's the unclean who are sick; it's the unclean who acknowledge their need for cleansing. The Pharisees would indeed do well to heed Jesus' exhortation to "Go and learn what this means: 'I desire mercy, and not sacrifice.'" Sacrificial offerings were a means of cleansing ceremonial defilement. Here, Jesus exhorts them to go and learn what God means when He says His desire is for mercy more than sacrifice. Mercy cleanses far better than the blood of bulls and goats. Mercy heals the sick. Mercy nourishes because it is well fed from all the feasting. Sacrifice, on the other hand, is often just a clever-looking mask of righteousness which covers up the real disease underneath. Sacrifice is often just a pious excuse to continue living sinfully as long as every rite is done in its proper order. And sacrifice could always be found laying on the great table of unhewn stones within Herod's idolatrous temple. Mercy, however, is found reclining at a table of bread and wine within a tax collector's house. 1. The "disciples" of the Pharisees are not mentioned explicitly in Matthew's narrative, but it is mentioned explicitly by Mark (2:18) and Luke (5:30, 33). Matthew's narrative certainly implies "disciples" by the plural use of the term "Pharisees," alongside the designation of the "disciples" (plural) of John (singular). By the time of this encounter, John was already in prison (Matt. 4:12), and there was no official title for John's disciples. There was only a general description of whose disciples they believed themselves to be.